Welcome to day 4 of our special Second Anniversary Celebration at Our Daily Bread designs! Today, we are using our *All-Time-Favorite* ODBD Stamp Set! Come & play along with us because the chosen by random winner will receive ONE FREE ODBD Stamp SET of their choice!! Check out the details at ODBD blog here. You have until 8:00 pm EST tonight to link your creations to Mr. Linky on the ODBD post! If you're uploading to SCS or other online galleries, please use this anniversary keyword: ODBD2AC4. Make sure to check back because there will be very Special Edition Anniversary Releases and Blog Hop to reveal these! You do not want to miss it!!! DONT FORGET, there is also HIDDEN blog candy along the way by our Designers who will reveal they had the candy tomorrow on their blogs along with winners. ALL winnings, the celebration challenges, the blog candy & the reveal of the new ODBD anniversary sets will be recapped in an announcement on Wednesday at ODBD! So be sure to check back then!!! Stamps: My 2 Favorite Stamp Sets from ODBD "Light Of The World" & "Keep the Lamp Burning". Now hop on over to the participating ODBD Designers below & leave 'em some love for your chance to win! Thank you so much for stopping by & for your kind support! Good Luck & Happy Creating! Oh, I love, love this card , America ! Love all the layers , all the nice touches and such a great set ! America, your card is wonderful! Everything meshes so well! Really like all the additional touches to this card , it is beautiful. This is so beautiful! I love how it all looks so "weathered" but still so breathtakingly gorgeous! TFS! Stunning, absolutly beautiful. How could ever give this away? America...this is fabulous! I love the ruggedness of it, the texture, everything! WOW America this is incredible!!! Love the texture of this card, gorgeous colours and design!!! Wowers girl, I-m loving all your spectacular details. Beautiful card, America. Love the twine and the charms too. Love the stamp set too you used. Thanks for sharing. Awesome card America. Love all the details. Where do you get your charms? Oh, my word! This is incredible and so beautifully detailed! It needs framing, America! Stunning card and detialing! Love how you blended these two sets, too! Wonderful scripture card! Great card ! I would definately make this one for my Father In Law a good Christian man who loves lighthouses! Your card is gorgeous, America. Love all the added elements you added to it. Very, very impressive card! Wow!! This card is stunning America!! I just love all the layers and textures!! So many awesome details!! It has a shabby chic feel to it!! Gorgeous take on the challenge! Another stunner!! I love everything about it, the embellies, the details, the sentiment...well, everything! This is a MASTERPIECE!! Love the burlap and all the coordinating charms!! Thank you for showing a "manly" card...I sooo need to learn how to make one! LOL! This is one beautiful card, America! I love all the natural fibers you incorporated into it and the charms are wonderful. Just a fabulous card! Soooooooooooo much detail and creativity. Wowza! This is fabulous, America! So many wonderful details! Beautifully done! 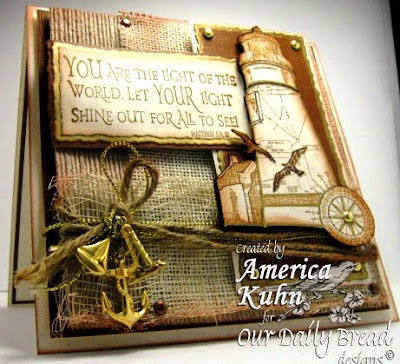 Love the anchors and the burlap. They really make the card. America, what a STUNNING card - love, love, love it! Your card is Amazing!!! wow, love the texture and the design! Your sense of dimension and texture is amazing here America! What a gorgeous card! So stunning and oh so gorgeous! Just amazing! OH my word America!!! THIS is gorgeous!!! I have no words! I am speechless!!! What an absolute piece of art!!! The burlap, charms... oh my... whew! Can I send you my address now???? LOL! Arrr, love this sea worthy card! All of the little elements look amazing. A wonderful verse! That is my favorite set too. Lovely card, love all the texture and your charms. What an awesome card! Love the combination of textures and colors you used to create this masterpiece! Thanks for sharing! I love thiese two stamps! I LOVE how you have displayed this..on a card? I love all of the layers, and the charms, and the burlap! I searched for burlap on Tuesday...and couldn't find it anywhere! You must have special sources! Thank you for sharing this awesome card with me/us. Beautiful card--would be great masculine card. I love this card! The lighthouse set is also one of my favorites and I like the verse very much. I love the rustic touches you added to the card. It is just perfect. Great card! Love all the texture! Nice card again. Thanks for sharing! Wow! Second lighthouse I have seen on this hop--love all the layers under your images! Ohhh- I haven't seen much done with this set, but the two cards I have seen today - I now WANT IT!!! WOW! Fabulous card! TFS! WOW! I am loving this card, girl! The mesh background rocks. Thanks for sharing it with us today. Love the rustic look and texture on your card. Wow, I love the texture and masculiness of the card. Great for the man in your life. God bless! America this is amazing! I really love the burlap background! So creative! Really like your use of material for the background on this lovely card. oh my wordy America!!!!!! this is soooo absolutely AMAZING!!!! incredible work of art girl!! That's a fantastic card. Love that lighthouse and the verse. The anchor embellishment really adds a great touch! The choice of colors and materials makes this a perfect card for a man, although I wouldn't mind getting it myself! This is an amazing work of art! So much detail put into it - FAB! So full of total awesomeness!!! Everything about your blog is enjoyable. Thanks for being faithful in posting.